Business Motivational Speaker Derek Clark Shares His Highly Inspirational “Never Limit Your Life” Program! There are lots of motivational business speakers to pick from but Derek’s story is quite different than the rest. He knows firsthand on overcoming extreme obstacles and how to turn stumbling blocks into stepping stones. He has inspired many audiences to develop their mental toughness muscle as well as their courage and patience muscle. Derek’s business keynotes are based on true life experiences that have turned trials into triumphs. 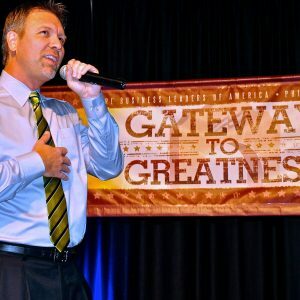 As an inspiring business speaker, Derek has encouraged thousands of employees to develop the mental strength to overcome adversity and excuses. His keynote speeches aim to cultivate focus, ambition, and accountability. Derek Clark knows that a great employee has to have these specific character traits: self motivation, discipline, integrity, creativity, vision, dependable and a positive attitude. Derek is a multi million dollar producer, an international motivational speaker and author of seven books titled Never Limit Your Life: From Personal to Professional, and the critically acclaimed I Will Never Give Up book series. Derek’s earlier successes include founder and CEO of the highly successful corporation Fast Mortgage.com. Reserve Derek Clark now to make your next event the best one yet! Your employees are ready for the next level of success!